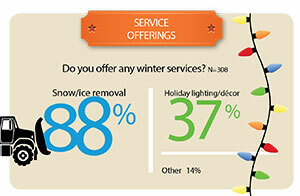 Lawn care companies are adding services when looking to grow. Though fertilization and weed control have long been the mainstays for traditional lawn care companies, other services are prevailing as ways to increase customers’ total spending levels or reach new clients. 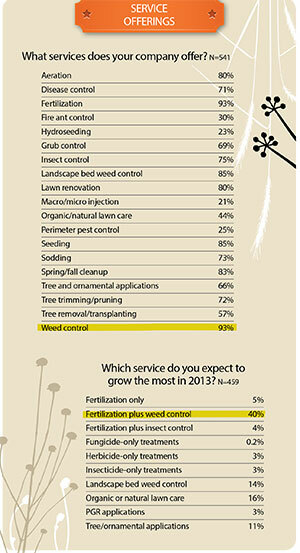 When it comes to the service that will grow the most in 2013, lawn care operators (LCOs) expect it to be their bread and butter—fertilization plus weed control. That’s followed by organic and natural lawn care, landscape bed weed control and tree and ornamental applications (see chart), according to Landscape Management’s Lawn Care Market Report survey. Anecdotal evidence shows companies are adding other niches. Lawn Dawg, Nashua, N.H., and its 10 branches are considering adding a few new services, says owner Jim Campanella. One of them is mosquito control. The mosquito control effort is in the early stages, he says, noting the company’s training director is studying the options. 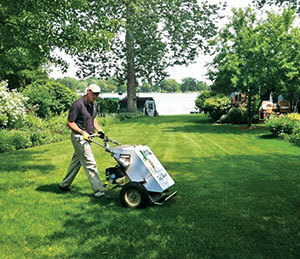 In the Midwest, Chalet initiated mosquito control this year, and Soil and Turf Department Manager Bill Leuenberger is anxious to see how sales will go. The company likely will begin selling it in May. “It’s taken us all winter to put everything together,” he says. “This year is going to be trial and error, but we’re confident in the products we’re using, which are a combination of organic and synthetic materials, so that’s kept some of my fingernails on.” Chalet plans to market and sell the service, which will be offered biweekly and for special events, through its retail location and also to maintenance and lawn care customers. Tick control is another service Lawn Dawg is looking to expand, Campanella says. “Ticks are more prevalent over the past couple years and carry a lot of diseases, especially Lyme disease,” he says. The service is popular in the Northeast and especially New Hampshire, where the company is headquartered; the state has one of the highest rates of Lyme disease in the U.S.
Insect control is also a growth target for MRW Lawns in La Plata, Md., which is slowly launching termite and pest control. Co-owner and Technical Director Rick LaNore got his wood-destroying insect certification two years ago. “We’re trying to market it to our existing customers, but we haven’t cracked the egg yet,” he says. Even though the company isn’t doing full-scale termite and pest control yet, it has had some success offering a termite monitoring service. from creepy crawlies. For example, Chalet has a waiting list for its specialty lawn renovation program that controls creeping bentgrass and nimblewill with three herbicide applications in a six-week period, followed up by slit seeding in the fall. Lee Kral, lawn service manager for Mountain High Tree, Lawn & Landscape Co. in Lakewood, Colo., has added two new services: iron treatments and dog spot treatments. Applying wetting agents is a specialty offering Lawn Dawg’s considering. “In the Northeast, we have watering bans throughout the region that go into effect the minute things start to get hot and dry,” Campanella says. “It will allow our customers to keep their lawns greener with less inputs.” Ideally, the wetting agent would go down with the last spring or early summer application, before the lawn goes into drought stress, he says.